Yakub Bi played the role traditionally accorded to the dead person's oldest son, lighting his pyre. 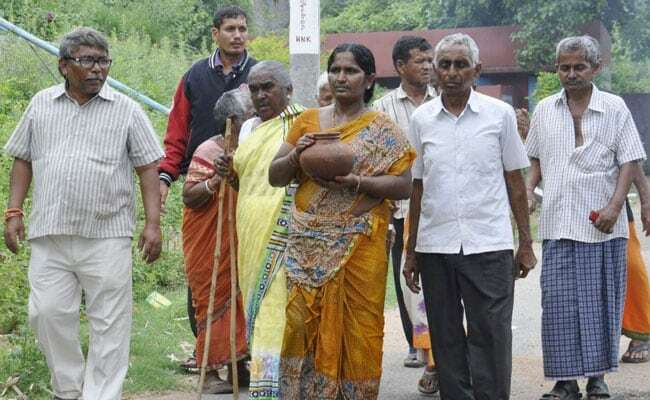 When a Hindu man who lived at a home for senior citizens died earlier this week, it was a Muslim woman who performed the last rites at his cremation in the Warangal district of Telangana has shown by performing the last rites of a Hindu man, abandoned by his own family. Yakub Bi runs an old-age home with her husband where the couple looks after 70 seniors, free of cost. On Tuesday night, K Srinivas, who worked for years as a tailor, died in her care. He was 70. Mr Srinavas had been found two years ago at a bus stop, partially paralyzed. He told Yakub Bi that he been abandoned by his family. It was only after his death that Yakub Bi was able to locate his son, Sharath. He attended the cremation, but said that because he had converted to Christianity, he could not follow Hindu rituals for his father's funeral. Yakub Bi's husband was travelling; she decided to perform Mr Srinivas' last rites because he was "like a father" to her. So Yakub Bi walked around the funeral pyre, an earthen pot on her shoulder, and played the role traditionally accorded to the dead person's oldest son, lighting his pyre. Surrounding her were most of the seniors she cares for.